Rarely has a new car attracted this much attention a full year before its official market launch. The Nissan GT-R reaches for the stars on the wings of a twin-turbo 3.8-liter V6 engine with 485 hp / 356.9 kW and permanent four-wheel drive. The development of an extensive tuning program at COBRA N+, the division of Cobra Technology & Lifestyle (Alleestrasse 15-19, D-33818 Leopoldshöhe, Germany, phone +49 / (0) 52 02 / 99 92 60, fax +49 / (0) 52 02 / 99 92 50, Internet www.cobra-sor.com) that exclusively deals with the customization and tuning of Nissan automobiles, is running at full steam. Power can only be substituted with more power. The COBRA N+ engineers are already hard at work developing engine tuning for the turbocharged engine. The first tuning stage is projected to deliver 550 hp / 404.8 kW, with an increase in torque to 680 Nm. To achieve this goal the engine electronics are reprogrammed, boost pressure is increased by 0.15 bar and the air intake is modified with sport air filters. Also under development is a free-flow COBRA N+ stainless-steel high-performance exhaust system with metal catalysts. Thus powered the Nissan GT-R from COBRA N+ will sprint to 100 km/h in less than 3.5 seconds, on its way to a top speed of some 320 km/h. Plans exist for a COBRA N+ RACE PERFORMANCE engine version with 620 hp / 456.3 kW and a peak torque of approximately 800 Nm. COBRA N+ also adds further sporty character to suspension, wheels and brakes of the new top-of-the-line model from the Japanese carmaker. Three-piece, extremely lightweight 21-inch COBRA N+ light-alloy wheels are slated to fill out the space beneath the wheel arches perfectly. They’ll also create the necessary space for COBRA N+ eight-piston brake calipers and 405-mm brake discs on the front axle. A COBRA N+ coil-over suspension gives the sports car even better handling. It features a multitude of selectable settings for ride height and damper rates. 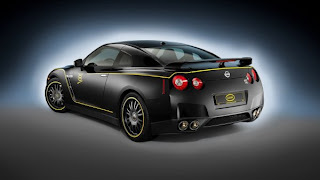 The COBRA N+ tuning concept for the GT-R also includes a sporty designer suit. The front of the two-door car receives added character with a new COBRA N+ front apron with large air dams. The aerodynamic-enhancement part also reduces lift on the front axle and improves cooling-air supply of radiators and front brakes. COBRA N+ rocker panels ensure optimal air flow between front and rear wheel arches. The rear is upgraded with a new COBRA N+ rear apron with integrated diffuser, and a larger COBRA N+ rear airfoil. The COBRA N+ Speed and Stripes decal kit accentuates the striking lines of the sportscar. For customizing the interior COBRA N+ offers two different options. Nissan GT-R owners can choose from a luxurious COBRA N+ interior with specially sewn upholstery for seats and doors, made from a high-quality combination of leather and Alcantara, and a COBRA N+ racing cockpit with ultra-light carbon-fiber racing seats, six-point seatbelts and roll cage. The COBRA N+ tuning program for the Nissan GT-R will be available for the car’s European market launch in the spring of 2009.